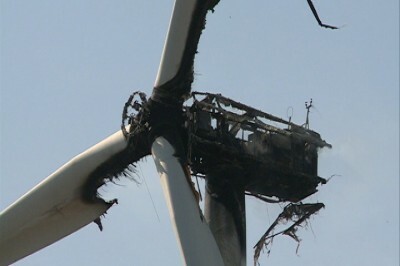 MASON CITY, IA – A wind turbine near Grafton caught fire Tuesday afternoon. The flames were pretty strong for a while as the smoke streamed from the tower. Fire crews didn’t get too close at first because of burning debris falling down. However they are now off the scene. Neighbors who live nearby tell us there were a few clues something was wrong. Not much information is being released at this point … but there were trucks with the company name “Iberdrola Renewables” on them. According to their website they are the second-largest developer of wind projects in the U.S.